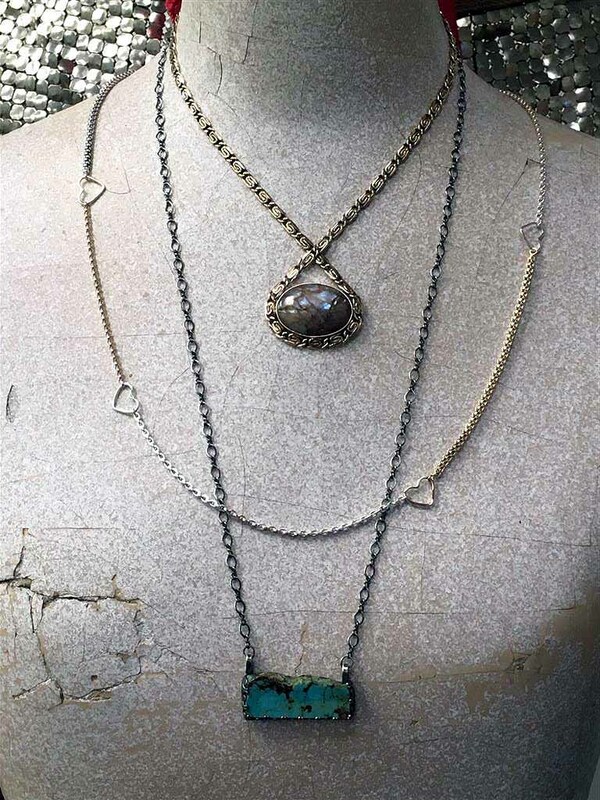 14K Gold here, Sterling Silver there, take turns on this eclectic chain & hearts necklace. 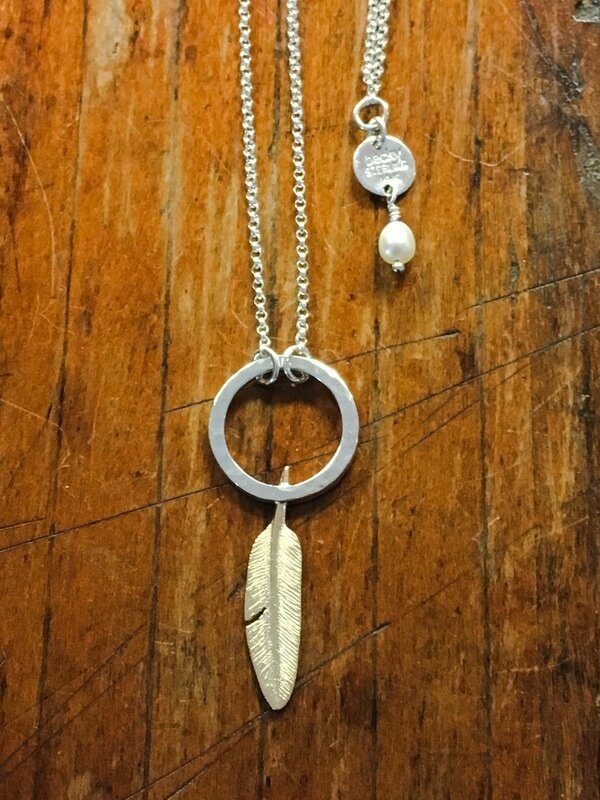 My hand-carved feather in 14K Gold creates the simple sophistication of my Sterling Silver signature necklace. A freshwater pearl adorns the back. 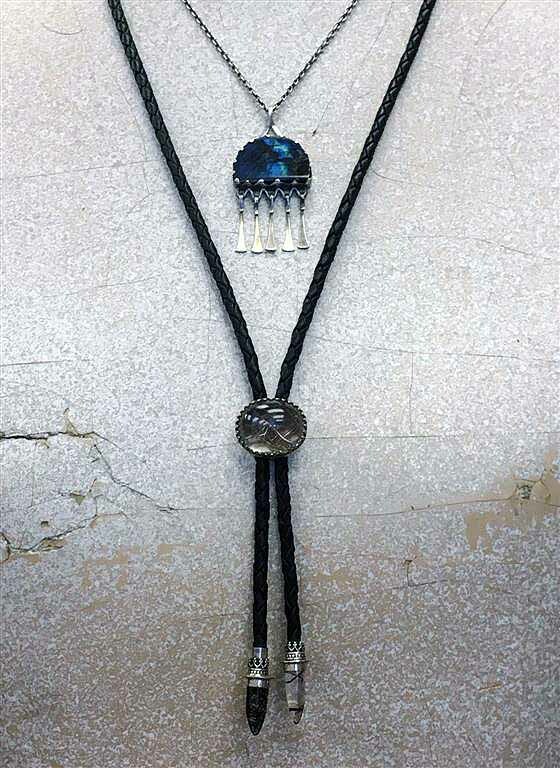 Exquisite Rutilated Quarts ornately set in Sterling Silver compliment 30" of braided black leather for that cowgirl classy look! 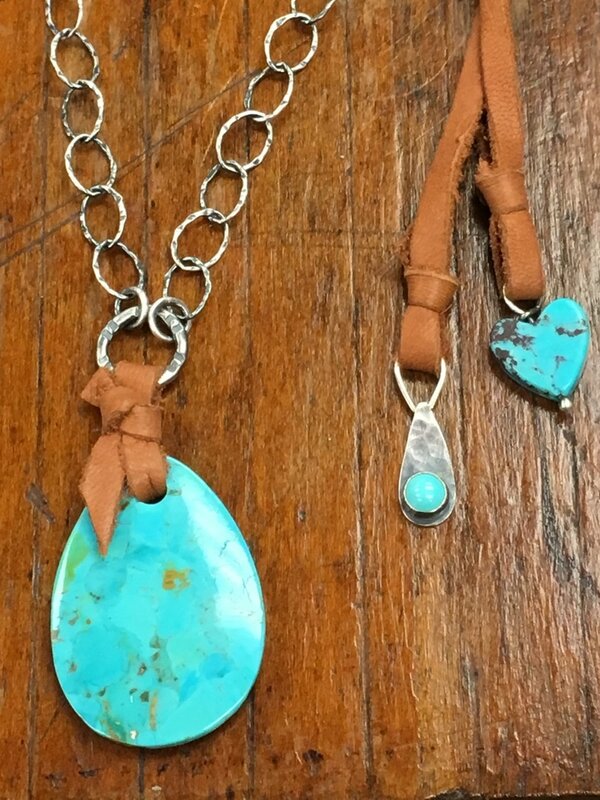 No need for description, this turquoise speaks for itself! A scallopped bezel and hanging "twiddlies" show off this beauty of a Labadorite set in Sterling Silver. Gold Filled chain wraps around this Spectrolite sparkler creating... WOW! Lots of Turquoise partner up with strips of leather and silver chain on this 30" necklace. Sterling Silver and Gold Filled showcase Turquoise, Citrine and a Freshwater Pearl, in this delicate Victorian inspired necklace. 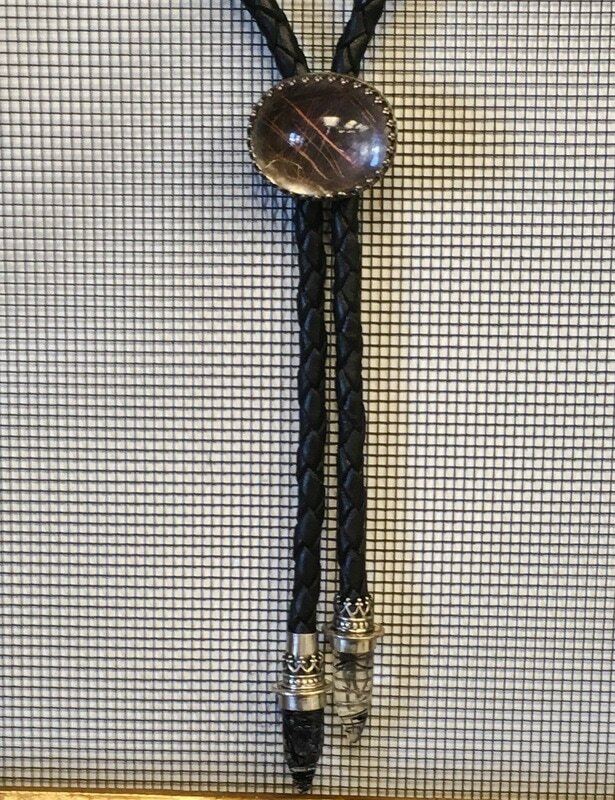 The time honored technique of chase & repousse created this 4" sterling silver pod pendant, hanging from 18" of braided leather. This hand carved and cast 3" sterling silver pod pendant nestles a synthetic Alexandrite. 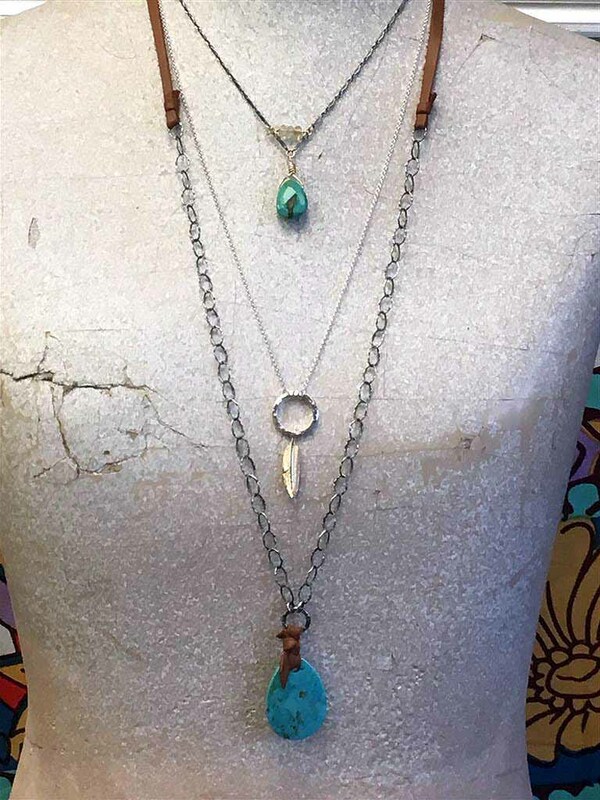 Oxidized Rolo chain connected with my custom feather complete this unique necklace. 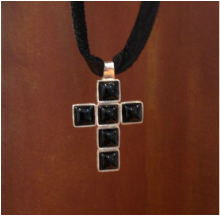 Simply stated... six square black onyx set in sterling silver bezels, 1/4" leather strip, button black onyx closure... simply striking!